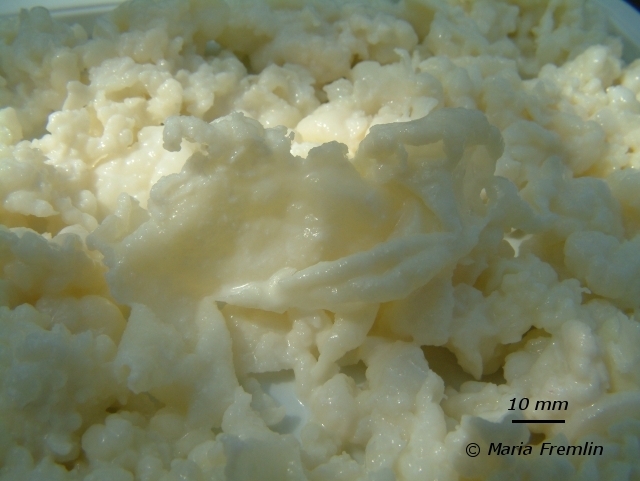 Kefir is a symbiotic association between bacteria and yeasts. Dr. Hidemasa Motosima, a mycologist, has analyzed some kefir cultures, including ours. Now my staff underwent the investigation of the microbiota of 4 kinds of kefir grains recently collected including yours. Lactobacillus kefiranofaciens, Lactobacillus kefiranfaciens subsp. kefirgranum, Lactobaillus kefiri, Lactococcus lactis subsp. lactis and cremoris, and others. Yeast microflora are different in each culture. But we will inform you later about the detailed composition of just your particular kefir grains. I did not do the experiment by myself, and because of shortage of my staff, I can not expand the worldwide collection of kefir grains. Our work will be published in English later, but the exact date of publication is not planned yet. PS: in March 2011, Dr. Hidemasa Motosima told me that he has now moved to another job, therefore he could not continue to study fermented milk.